My name is Tracy Mooney. 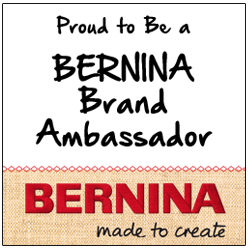 I am the senior editor for Generation Q Magazine, I am a BERNINA brand ambassador and a quilter. Since being diagnosed with Sjogren's Syndrome in February of 2013, I have made a lot of changes. My sewing life is no different. I have had to approach each new quilting or sewing project in a completely different way because I don't know how I will feel. On some days, I may experience brain fog or I might have swollen and painful hands. These are days where I might want to be creative, but I certainly need to steer clear of the rotary cutter. Sewing has so many health benefits! Recent studies point to lower blood pressure, helping to cope with trauma, and even help improve memory and ward off dementia.So for me, I feel that sewing is as much a part of helping me to stay positive and healthy as is taking my medicine, going to the doctor and leading a healthy lifestyle. Since writing an article on products that help you keep sewing when you have health issues for Generation Q Magazine, I have found many products that help people continue to sew when their bodies disagree. This may mean products that help the vision impaired see the stitching line, people with arthritis cut precisely, or sewing tables that are wheelchair accessible. In some cases it may not be products that are marketed as such, but absolutely will help you KEEP SEWING. 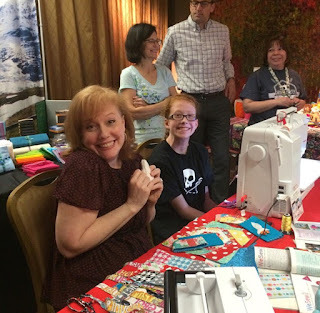 This blog is my contribution to the quilting and sewing community. This will be a place to encourage quilters and sewists of all levels and experience. I will post weekly and encourage active comments about what works for all of you and I look forward to the discussion! Will you have a "subscribe by email" button? Done! Thanks for the reminder! Wow! I am astounded at your blog. I am on total disability because I have Bipolar Disorder, severe anxiety, OCD and other wonderful things! Quilting is what I do every day so I understand how helpful it can be. I am very interested to see where your blog goes! Thanks for stopping my! I have family with bipolar disorder so I know how frustrating diagnosis and meds can be for that. I hope you come back to visit when I post more! Having autoimmune issues and degenerative disc disease, I highly anticipate this blog! Thanks for sharing your insights! I have degenerative disc also - it stinks doesn't it? I just posted another blog that discusses my diagnosis and how my AI issues helpd my DDD. Let me know what you think. I have severe back issues and some days sewing is the only thing that keeps me sane! Love your blog! Boy do I understand! Thanks for reading!